Day One at the Tucson gem shows is over. One day, and my feet are killing me! But my stomach is full of the best meat loaf and potatoes, not to mention dirty martini, we could find in Tucson. Two words: Claim Jumper. Broadway, just west of Alvernon. ‘nuf said. And lest you think I’m going to write about jewelry and gems, I met with no less than seven pre-owned watch dealers at the Holidome show. I saw the usual and the unusual. Mostly Rolex of course. The brand is the most recognizable, the most desirable, and therefore, the most available in the pre-owned market. The sad part is the shows don’t allow photos, so I only have some that I sneaked of the unusual. So I hope my prose is up to the task of describing the unique things I saw. First stop was the Denver Trading Company. DTC had two cases of the usual Rolex suspects (DayDates, Datejusts, Submariners, etc. ), plus a case of nice newer pieces. And at least in Rolex , they had a nice selection of ladies watches, both unadorned and blinged up with diamond bezels and dials. And in an upright case, DTC had a nice selection of older Cartier, a few Patek Philippes, and a beautiful pie-pan Omega Constellation in yellow gold, with some vintage Rolex thrown in for good measure. Next up was (were?) The Watch Experts from the jewelry district of LA. Mike Mertaban is a fourth generation watchmaker and buys all over the world. His cases show it. They’re split almost equally between Rolex and numerous other brands. Among the selection, I spied a nice Coke GMT-Master and a nice selection of midsize and ladies Rollies. Plus, Mike also had a sweet little Speedmaster 376.0822, a Speedmaster automatic with a Lemania 5100 movement from the late 1980s. He warned me off that watch though. “Can’t get parts,” he said. Part of Mike’s sales pitch for pre-owned watches is that Rolex sent a letter to all ADs saying prices were to be raised 12% on January 1. Soon after, apparently in conjunction with the shenanigans around the Swiss Franc, Rolex sent a second letter saying disregard the 12% increase. It would instead be 20%. I haven’t had time to verify this, but it sure speaks to buying pre-owned, doesn’t it? Wandering on down the isle, I chatted with Majid Zarnegin of Zarnegin Jewelers, also in the jewelry district of LA. 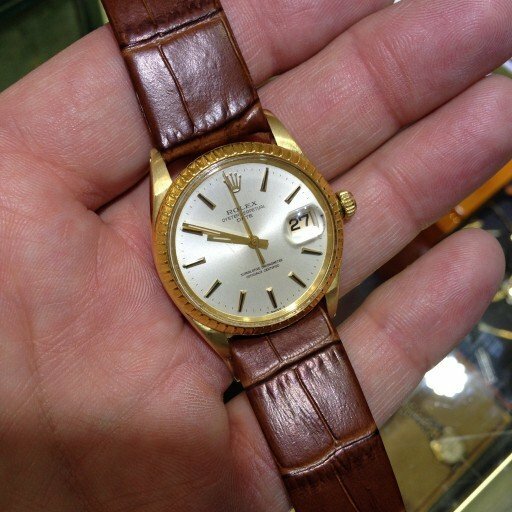 He showed me a sweet 1967 18K yellow gold Oyster Perpetual Date on an aftermarket strap. Also tucked in a corner was an 18K yellow gold midsize Datejust with a president bracelet. Very nice. It turned out we’d be back to Majid’s booth. But that’s a story for another day. He wanted to chat with the Rolex dealer I’d been talking to so his wife walked me down to the booth where he got it, Rewind Jewelry. 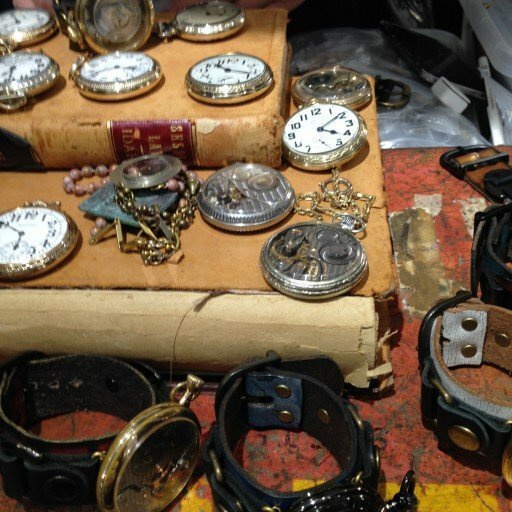 It turns out, Rewind Jewelry rescues and repurposes old pocket watches and ladies watches. They repurpose the ones that aren’t working into cufflinks, medallions, necklaces – all very steam punk. They’re doing a lot with hobo coins too, edgy to this reporter, but very cool. And they had a 15x or 20x working scale model of a tourbillon which was a fascination in itself. 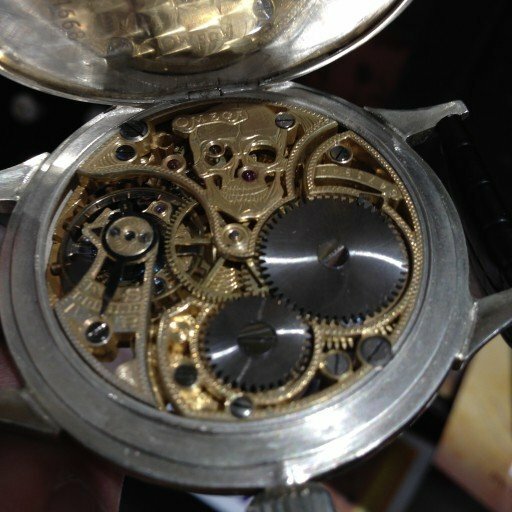 The Rewind boys take pocket watches that ARE working and make them into wrist watches. They re-case some in new purpose-machined cases, and solder lugs on others. The crown jewel was an old Omega pocket watch, the main plate of which had been skeletonized with Masonic symbols. Open the double case back and there was more carved into the ¾ plate. Just incredible! 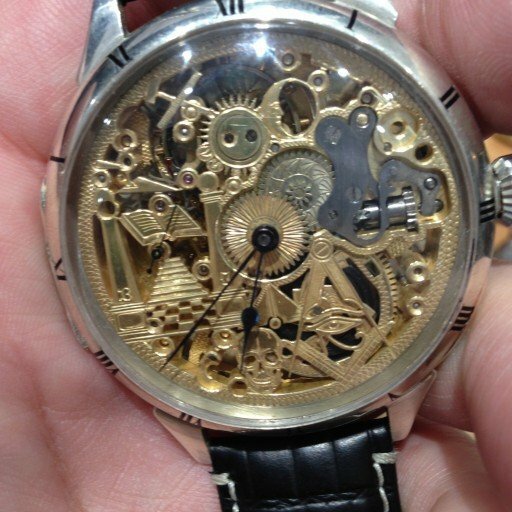 Sadly, the watch had been dropped at another show by an over-eager customer. The balance staff was toast. Still, the watch was easily the coolest piece I’d seen so far. Stay tuned for our next installment, which features quite a surprise for this reporter.